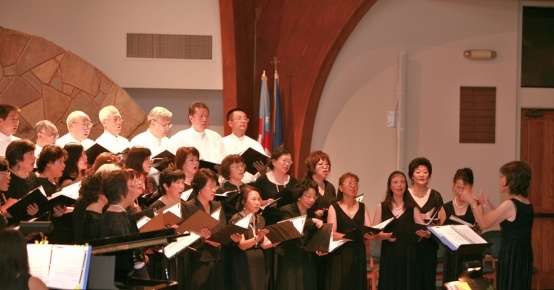 In cooperation with Ms. Lucy Lin's A Touch of Opera studio, The San Diego Chinese Choral Society held a combined concert on Saturday, 10/23 at the Good Samaritan Episcopal Church to another full audience. Featuring a guest performance by one of Ms. Lin's alumni students, Ms. Kyoko Yamaguchi, this also marked the first concert by the students of Ms. Lin's La Jolla studio, as well as the debut of the Choral Society's two new piano accompanists, Mr. Dan Yu and Ms. Hua Wang. Members: The next rehearsal will be on Thursday, Oct. 28 -- no break. Please remember to bring both music binders, and write your name on the cover and on the first page of the 10/23 concert binder, in preparation for turning it in. News article at the San Diego Chinese Press website. News article at the Five Continents and Four Oceans website. More pictures -- pictures courtesy of Alan Su Photography. Recordings by Mr. Sam Ho. Details of the upcoming 10/23 concert in conjunction with Ms. Lucy Lin's A Touch of Opera studio have been added to the Schedule page. Pictures from the second pot luck at Ms. Lin's home on May 8 have been posted on the Pictures page. Pictures from the pot luck at Mr. and Ms. Meng's home on April 4 have been posted on the Pictures page. This marks the beginning of the new concert cycle, with Ms. Wendy Meng retaining her position as SDCCS President, and Ms. Liyun Yeung assuming the role of SDCCS Vice President. Photographs from the concert were also distributed, and a viewing was held for the DVD recordings kindly provided by Mr. Sam Ho. Please contact your section leader if you still need photos or DVDs. Another party has been scheduled, as Ms. Lucy Lin is graciously hosting a post-concert celebration at her home on Saturday, May 8. SDCCS members and their partners are welcome to attend. Please contact your section leader with the dish you plan to bring. Officers, including section leaders, should plan to show up at 4 PM for a leadership pre-meeting. Finally, please note that there will be two rehearsal breaks coming up on Thursday, May 27 and June 3. 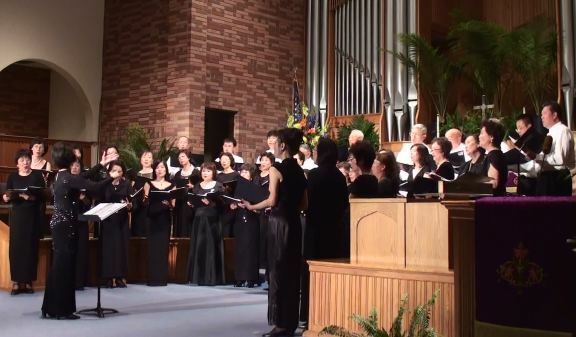 The San Diego Chinese Choral Society's annual concert took place this year at the Torrey Pines Christian Church in La Jolla, to a packed house of over 500 people. Over the course of an hour and a half, the SDCCS performed 15 pieces spanning Chinese compositions, Italian opera and Broadway musicals, and featuring a musical interlude with Mr. Xiaonan Zhang on the Chinese Erhu and Mr. Jiasheng Zhou on piano accompaniment. We thank everyone in the audience for attending, and hope to see you at the next concert. Members: Thanks for making our performance a success. Our next rehearsal will be on Thursday, April 15 at the usual time and location. A potluck will also be held on Easter Sunday, April 4, at 4 PM at Mr. and Ms. Meng's home -- please contact your section leader for directions, and bring your music binder. Members are also welcome to bring karaoke discs, if desired. Two additional sectional rehearsals have been scheduled in preparation for the 3/27 concert. The S1 + S2 sections have an additional rehearsal on Friday 3/19 at 7 PM at Ms. Lin's home in addition to the already-scheduled sectional on Monday 3/22 (please note that 3/22 is now also an S1 + S2 rehearsal instead of S2 only). The T + B sections have an additional rehearsal tentatively scheduled at Saturday 3/20 at 2 PM at Ms. Lin's home. The regular rehearsal on Thursday 3/25 is still in effect, as well as the dress rehearsal on Friday 3/26. The Schedule page has been updated accordingly. Please inform your section leader if you are unable to attend a rehearsal. The Taiwanese American Foundation of San Diego held its 13th anniversary celebration and fundraising dinner at the Taiwanese American Community Center, with entertainment organized by Ms. Helena Wei. Ms. Wei graciously invited the San Diego Chinese Choral Society to participate, and the SDCCS performed three pieces: Poem by Li Bai (lyrics by Qui Wen-Chung), Soave sia il ventro from Mozart's "Cosi Fan Tutte", and a Taiwanese folk tune, One Little Umbrella (by Chen Cheng). Videos from this event are available on the Pictures page. The flyer for the SDCCS performance on March 27 has been posted on the Schedule page. Members are encouraged to print out and distribute copies to their friends and acquaintances, or contact the SDCCS leaders for color copies for posting on public boards. The schedule of extra rehearsals has also been posted on the Schedule page. If you are unable to attend, please inform your section leader ahead of time. On Sunday, Jan. 17, the San Diego Chinese Choral Society was invited by the San Diego monthly magazine "We Chinese in America" (合唱, website) to perform at its special 100th issue celebration event. Billed as "The First in US: Poetry Reading and Music Concert," the magazine's publishers brought together literary and music groups from diverse San Diego Chinese communities for a festive evening's program to an audience of over 800. The SDCCS served as the opener for this event, performing two songs. Fittingly, the first song --- The White Clouds --- was a poem by Li Bai, the immortal Tang poet (李白：白雲歌送劉十六歸山). The second song, Descendants of the Dragon (候德健：龍的傳人), was a widely acclaimed campus-protest movement classic from the 1970s. Our enthusiastic music director, Ms. Lucy Lin, conducted the performance beautifully, and a good time was had by all. Though brief, this performance served as an excellent warm-up for the SDCCS members as we prepare for our own concert in March. Audio CD recordings of Ms. Lucy Lin's lecture, "The Voice as an Instrument," given in October 2009 at the Carmel Valley Public Library, are available for sale. A set of 2 CDs is $2 for SDCCS members, or $5 for non-members. A recording of Ms. Lin's concert CD may also be purchased for $5 for members or $10 for non-members. All proceeds will go towards the SDCCS general fund. The San Diego Chinese Choral Society will be participating in a celebration commemorating the the one hundredth issue of We Chinese Magazine at the Poway Performing Arts Center on Sunday, January 17, 2010. Members who wish to watch the other performances must purchase a ticket, and should contact their section leaders. Finally, a time and location has been set for the SDCCS's own concert. 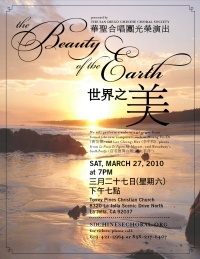 We will be performing on Saturday, March 27, 2010, at the Torrey Pines Christian Church, tentatively set to start at 7 PM. Further announcements will follow as the date approaches and tickets are made available.